Assad regime warplanes bombed YPG-controlled areas of the city of Hasaka in northeastern Syria on Thursday for the first time in the five-year-old civil war, a monitoring group said. Sources told Reuters the air strikes had hit YPG-held districts of the city, and the positions of the YPG security force known as the Asayish. The Assad regime military could not immediately be reached for comment. The regime still has footholds in the cities of Qamishli and Hasaka. Tensions erupted between pro-Assad forces and YPG groups in Hasaka on Tuesday, leading to the most significant violence between the sides since several days of fighting in Qamishli in April. YPG spokesperson Redur Xelil said government forces were bombarding YPG districts of Hasaka with artillery, and there were fierce clashes in the city. In a statement, YPG vowed to respond the regime's attacks. "We, in the People's Protection Units, will not be silent over these barbaric, flagrant attacks against our people and will stand firmly to protect it. Every hand spattered with the blood of our people will be held to account through all possible and available means," the statement said. The Syrian Observatory for Human Rights, which tracks the war using a network of activists, said warplanes had targeted YPG positions in the northwest and northeast of the city. 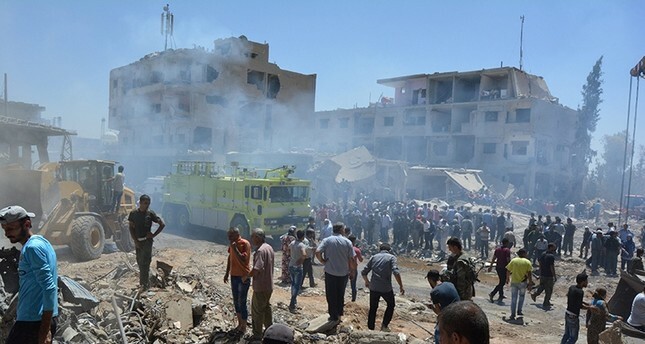 Meanwhile, the death toll from an attack Wednesday on the western section of Qamishli town in north-eastern Syria has risen to 55, with many victims still buried under the rubble, a hospital official told dpa. The Obama administration has been insisting that YPG and PYD are effective partners in the fight against Daesh, whereas Ankara continues to reiterate that there cannot be any distinction between good or bad terrorist organizations and asserts that these organizations are affiliated with the PKK, a designated terrorist organization by the U.S., EU and NATO.